If this was a chapter in my autobiographical how-to book (working title: Fired Up), it would be much longer and charmingly anecdotal, starting with one premise but taking off on profound and oh-so-meaningful tangents before returning to a heart-rending culmination. But, instead, it’s a journal entry and it needs to get in and out in 800-1000 words. I think I can do it – particularly the heart-rending part – and I will tell you the word count at the end. Speaking of possible titles, I could have called this post James and the Giant Hole in My Heart because just a little over a month ago my artist friend and broad-spectrum local art scene mentor, James Aschbacher, died suddenly. I am not alone in my dysphoria. This. Did. Not. Happen. Waking life now has become overtaken by an impossibly retro Nihilistic film, where eerie B/W horrordreamscenes play out incongruously. Everywhere I go, from newspapers to online tribe, from meetings to gallery installations, trying the while to behave like I am not in this film’s audience, I encounter others watching it too. I watch them watching me, with that impossible narrative reeling all around us. We speak haltingly of our reluctant watching and hang our heads in mesmerized grief. And, what now? Well, sometimes the fog of watching something so wrong morphs into a desultory bit of fiddling. And by the act of doing something, anything, we begin to rouse ourselves from the infernal trance. It’s how we continue in the face of such an existential absurdity. There are two observations I want to fold into this doing-as-healing musing, and both involve this year’s just-opened Members’ Exhibit at the Pajaro Valley Arts Gallery. This year’s theme, “What Nourishes Us,” is a broadly inspiring prompt for art-making if ever there was one. To my mind it ventures way past food to the bedrock components of cultivation and sustenance. First, I knew I wanted to use those laboratory-like glass vials and metal rack you see up top in some sort of steampunky found object assemblage for this exhibit and I had pleasantly mulled over the possibilities for months. So far, I had obtained different and fancier tops: stoppers with room for a custom ceramic bead! I had tested bead designs. 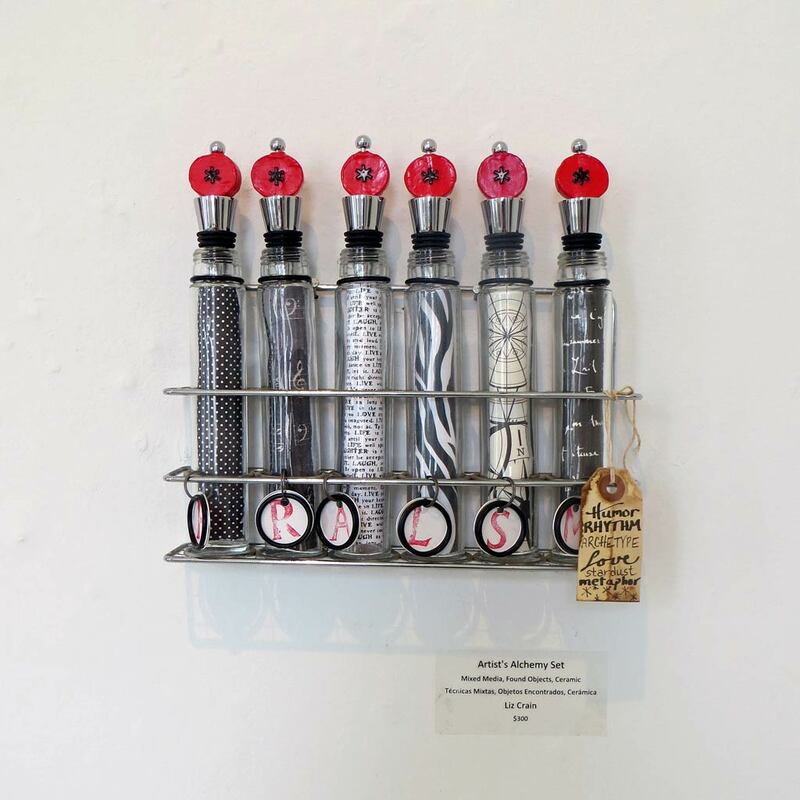 I knew I wanted fascinating Big Ideas in those vials, knew that I needed to augment that rack a bit, knew I wanted to work with red, black, white and silver. Once I hit on the theme of “ingredients for creativity” it was off to the races. I particularly wanted to give this work my heartfelt justice because the base parts were given to me by James and his wife Lisa a year or so earlier. They had found it on a morning walk by the Santa Cruz Yacht Harbor, tucked it away in their garage, waiting, and when I casually mentioned I was interested in making ceramic responses to found objects, James retrieved it saying of course it’s yours, it’s found you! This piece was well on its way to completion, sitting perkily on my worktable, when I got the news. I had so been looking forward to sharing it with James, and then…that dang trance! But yeah, I kept fiddling anyhow, completing the piece with a few unexpected details. That doing something holds a righteousness of purpose; a head may be down, but it is grateful to actually be in motion. I let the work lead me to a place which reflects the personal artistic nourishment I have received from James over the years. The Artist’s Alchemy Set offers Humor, Rhythm, Archetype, Love, Stardust and Metaphor, all pure James ingredients which would have made him chuckle delightedly. I hear it. 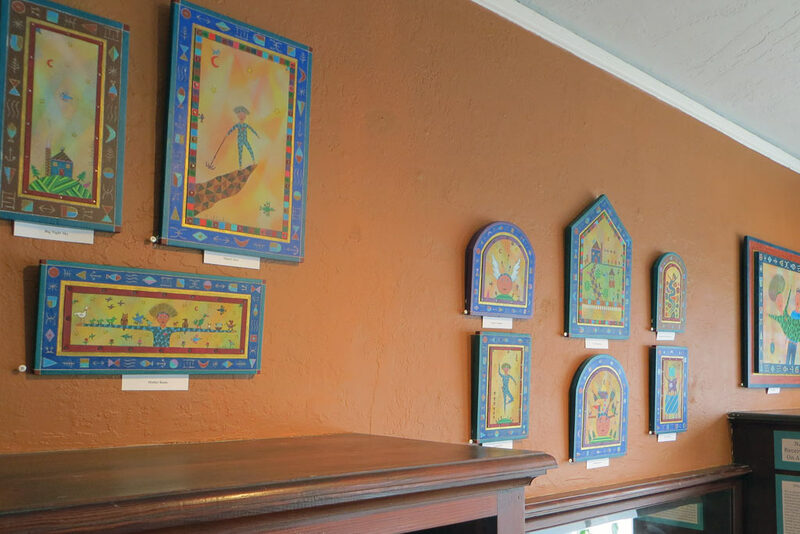 Secondly, a few years back James took on revitalizing the Gallery Shop at the Pajaro Valley Arts Gallery, helping to nourish that home for local arts with another stream of income. I sold my stuff there along with an ever-changing array of excited members, and James worked assiduously to keep it interesting and refreshed. Now, though, there was an immediate need for a curator as the Members’ Show was in the wings. I don’t know who first floated the notion, but since so many of us owned works by James, it was proposed that we gather up as many of them as we could and together we would turn that space into a warm and wonderful paean to one hell of a member. Turns out doing something is balm to a mourning group as well. Below is just one wall of that room, a temple, really, offering cultivation and sustenance – a wealth of nourishment – to us all. –Liz Crain, who explored this difficult and at the same time exalted turn of events in 834 words! The “infernal trance” nails it. Shock and grief sends you to the other side of a blurry veil and it’s hard to cross back from behind that waterfall of grief into clarity…..until you dive into making, honoring, and sharing, thereby allowing yourself to break the fast and be nourished. Good on you, pal. Thanks for nourishing us all with your beautiful words. Rest in peace, dear mentor James. Well now Connie, you’ve just expanded on the whole idea. I know you’re speaking from experience and the “honoring and sharing” parts are crucial as well. It’s definitely a portal we step through and I like the idea of stepping back and forth. Peace to us all. Ah, Mary…lots of hugs…we keep finding the ways, don’t we? thank you for this nourishment, Liz. I’m going to go do something now. Yep! Nourishment begins with each of us.